Mainland actress, Yang Mi’s (杨幂) beauty was often questioned whether it was surgically enhanced. Recently, a Weibo user by the name of “Catwalk Lam Si San” (Catwalk林诗珊) claimed to be Yang Mi’s former friend, allegedly accompanying the actress to receive plastic surgery in South Korea! The true identity of “Catwalk” remained unknown, but her claims aroused widespread speculation as to whether Yang Mi had indeed received plastic surgery. Catwalk wrote on Weibo, “Originally, I thought that we were good friends. For your music recording, I stayed overnight at the studio waiting for you. For your face, I spent one week in South Korea with you! And your matters with the production crew…I have not told any outsiders. Now, you do this to me! In this case, we will look out for ourselves in the future!” Catwalk flagged the post to Yang Mi’s attention. Although Catwalk’s post was suspected to be fraudulent and perhaps a prank, the message aroused widespread interest in whether Yang Mi had indeed received plastic surgery procedures. Chinese search engines were flooded with visitors querying whether Yang Mi had gone under the knife. 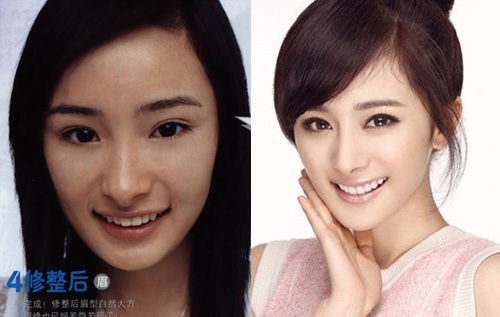 Comparing Yang Mi’s old photos to her current features, it may be highly possible that she did receive cosmetic enhancements. As a child, Yang Mi exhibited a strong nose hook, which she carried in her late teenage years (see middle photo). However, her recent photos show a more refined nose tip from her former years. Upon closer inspection, it appeared that the shape of Yang Mi’s jawline appeared significantly rounder in recent years. In the past, than angle of her jawline was quite sharp, lending to a somewhat squarish effect, while recent photos revealed Yang Mi’s jawline (the point where the jaw meets the ears) to be much rounder. Yang Mi was blessed with good looks at birth. The cosmetic procedures done to her nose and jaw did refine her features, improving the overall proportion and symmetry of her face. Jayne: Yang Mi’s chest was also speculated as to whether it is natural as well, but a preliminary image search did not produce the answer. even if she did plastic surgery i dun think she did much on her face coz she look pretty from young..compare to other female artist..anyway she look great..
Bc the chinese people hate losing “face” especially among the elder generation. “Face” is worth more than life or even $100.000 worth of gold bars, LOL. Are there any actresses from China that did not go under the knife? Yes, many. For example: Hu Jing :). I don’t think so, she look the same to me, only lost some baby fats and heavy make-up. Losing baby fat and using make up cannot change your nose that much as well as your face shape. She definately went under the knife. I wonder if she got her teeth done to replace all of the teeth that she lost from lying so much??? The teeth can be fixed without PS :P. I thought you know that? I know that but was just wondering if she got her teeth done, that’s all. I wonder if fixing your teeth is considered PS??? I think no. It dun need the surgeries. While the results are noticeable…Yang Mi still looked attractive in the before photos. I’ll say Angelababy’s makeover was more shocking. Yea, Yang Mi’s plastic surgery was very minor compared to Angelababy, Viann and PSS. Agree that Angelababy’s makeover is indeed shocking. I’d like to add that viann’s too is shocking but still in denial for having PS done. Viann and Angelababy are both so pathetic… Wait until one day when something falls off, I wonder if they will admit then?? I also wanted to add, please don’t remind me about the nose. I got a hit to my nose the other day. I was totally imagining that if I had my nose done, what would have happened….I wonder what would happen to them if they got hit in the nose?? It depends on how PS your nose were done and how severe your got hit I think. I think PS nowadays is pretty modern and advanced, parts won’t fall off that easily and most PS result are already pretty natural (provided you got your job done at those Expensive and certified surgeons). Yea, I know that but still something that is not natural is still more dangerous in my opinion..
Im not sure if this is true or false, I heard this from a friend of mine, she said those ppl who had PS will have their new tissue grow with those plastic that was installed under your skin. Meaning the nose will take shape as per the new shape because new tissue will grow and form accordingly to the shape.. sorry if u still dont get me, I’m not a doc so i can’t explain that in detail lol. Not too sure about that and have not heard about it before either.. I do know that one of my mom’s friend’s had a nose job that had gone bad and became sick because of it. She then had to get it taken out and looked even worse then she did before. But she lied to my mom about it. My mom then found out from others about what really happened. I hardly think chin, nose, cheeks whatever jobs are minor. I feel it is major work done but not extensive. I agree but I think Yang Mi did not change her nose and chin as much as Viann, PSS and Angelababy did. At least Yang Mi still looks like herself while Viann, PSS and Angelababy all look like completely different people. Yang Mi had nice features to begin with, particularly the lively eyes and strong nose shape. Her nose tip may have been a bit long…. Yang Mi resembles Audrey Hepburn so much…very delicate features. Even with her former angular jawline, I think she looked fine. I couldn’t tell if there were some derma fillers injected into the jaw to make it protrude more and give a stronger chin though. As for Mavis Pan, Viann Zhang, and Angelababy, due to the sheer number of changes and jobs done, they weren’t too happy with how they looked in the past. Audrey Hepburn as in elfin like face? Or is it pixie like? I disagree. And I don’t like her lips. Gives me an impression she is tragic. Agree that Yang Mi has a tragic look to her, due to her eyes and elfin face. I think she possesses a very memorable face though, especially since she reminds me of Audrey Hepburn so much. Among 3 famous PSed girls, I think PSS did the less – only in lips and eyes got 2 clearer eyelids. The childhood picture in her weibo look the same to her now except the lips. If you based on the pix provided by the reporters (she wore a red Tee) then it was photoshoped in some parts to make her seem to be different. Yea, Yang Mi naturally looked cute and attractive already. I did not feel that she needed to have anything done. I don’t think she looks that much like Audrey Hepburn, but I can sort of see the resemblance. I don’t think so. PSS’s nose dun look change compared with her kid pic. All good to see she’s naturally beautiful since young although has some minor surgery. i love her n her acting is awesome! I think she also did breast implants; they’re too big for her thin size; and she used to be flat in that area not that long ago. It’s really difficult to find beautiful Chinese actresses that are natural these days. It would be better if there was a full front picture of the “after” Yang Mi. Can’t tell, it’s still looks hook nose to the side. Looks a lot like Ruco Chan’s nose. Definitely a nose job. Her natural nose did detract from her beauty so I can understand why she had it “corrected”. I don’t mind if people are unhappy with one feature and has it changed, but I think extensive surgeries that alter your facial features completely is crazy. She looks very pretty even before the PS with the chin. In fact I think prettier. I’ve recently watched a film that starred her and Chen Kun, called “The Door” (which is a terrible film. don’t waste your time watching it), and she looked very different. I don’t know if it’st he makeup, or she really did do something to her nose. But makeup really does wonders! Yang Mi hasn’t had any work done. She once filmed a kissing scene with Hu Ge and their nose bridges hit each others and her nose was bleeding from it. She said afterwards “at least this proves I didn’t get a nose job”. As for her jawline/chin, she admitted she had braces to ‘correct’ her jawline. Apparently she did this because an oval face shape is considered to be more attractive. However, they were braces and not plastic surgery. Also, don’t forget she extracted four teeth out for her role in ‘The Door’. I believe all theses things (and the weight loss/gain/workload) has led to her changing appearance! Huh? You mean if you did a nose job it will be like steel? Can’t punch it? Won’t bleed? Ok, that doesn’t make sense to me. Are you saying that she can’t get a bloody nose if you got your nose done?? I thought that your nose would be a lot more sensitive after getting it done?? Although she may have had some work done, I think they are very minor. I can still see a lot of resemblance from what she looked like before to what she looks like now. yang mi got do plastic surgery? i like to watch her show palace. got any related drama such as palace and scarlet heart? which show nice scarlet heart or palace? liu shi shi got do plastic surgery?